For nearly 40 years Roy MacGregor has brought hockey, our national sport, alive on the page. From tales of the game's greats (Guy Lafleur, Jean Beliveau, Marcel Dionne) to today's stars (Sidney Crosby, Alex Ovechkin, Daniel and Henrik Sedin), his magazine and newspaper coverage has revealed so much about these and so many other personalities, in moments of promise, victory and defeat. 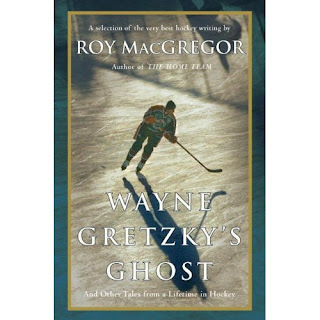 While many of these stories play out on the ice, some of the most compelling take place on the home front (Mario Lemieux's battle against cancer, the many tribulations of Bob Gainey), and MacGregor's prose shines especially when focused on the human side of a sport defined by superhuman feats of speed, aggression and power. Wayne Gretzky's Ghost will be a personal book, and also a book of challenging ideas: that Wayne Gretzky, through no fault of his own, was the worst thing to happen to hockey; that CBC's Hockey Night in Canada has lost sight of what it is; that goaltending has become a position out of all proportion to what was intended. And who could offer a better perspective on the game than a writer who, playing as a youngster, had to face an onrushing phenom from Parry Sound named Bobby Orr, or who spent a year ghostwriting a national newspaper column for the Great One himself? When it comes to hockey, Roy MacGregor has seen (and in some cases, done) it all. Joe's Note: I read this book while riding the buses on a recent trip to Vancouver. It got so into it that the first day I missed my stop. Two very rainy days later I was much more attentive to my travels, but I was enjoying the story about Bob Gainey's challenges so much that I purposely stayed on the bus past my stop in order to finish reading the chapter. Once I got off the bus I immediately ducked into a Tim Horton's and finished reading the book! Three of Canada's great treasures: hockey, Tim Hortons and Roy MacGregor.